Here are some photos from our trip down the coast to San Francisco. We had a great time, with a little excitement thrown in. We left Friday Harbor around 10:00 AM on Sunday, June 1, sailed well over 800 nautical miles, and arrived in Sausalito at 5:30 AM Saturday, June 7 — slightly under six days. The crew was Rich Jones, Jim Watts, Lee Youngblood, and Paul Elliott (me). 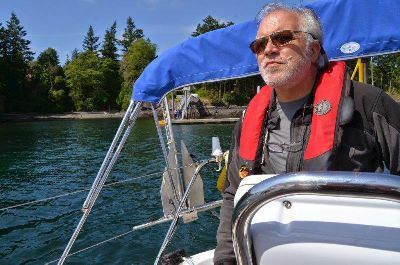 As we left Friday Harbor we were watching the conditions and forecasts off the coast between Cape Blanco (Oregon) and Cape Mendocino (California). This is typically a problem area in the summer, due to the inland low-pressure and offshore high-pressure systems. This “squash zone” sometimes extends south beyond San Francisco, and gale conditions can persist for weeks at a time. 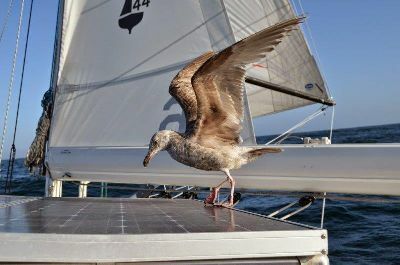 Getting around the capes requires a compromise — close to shore the winds are usually lighter, but the seas can be pretty confused. Offshore the winds will be stronger, but the seas more regular. The offshore seas may be bigger, but this may be preferable to the jumbled-up waves caused by the shallow waters, uneven seafloor contours, and waves reflecting off the shore. (© Jim Watts 2014 ) That’s Mary, Edie, and Ben on the dock, seeing us off. (© Jim Watts 2014 ) Lee, Rich, and Paul. Jim is taking the picture. 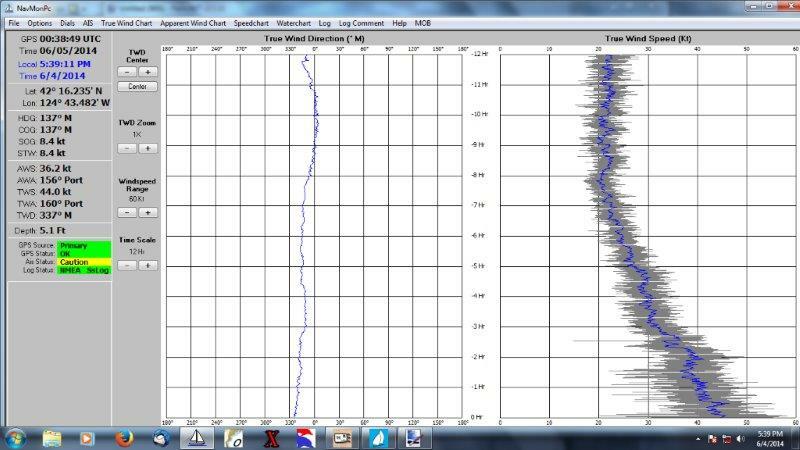 You can see a solid 45 kts average windspeed, with gusts hitting 60. 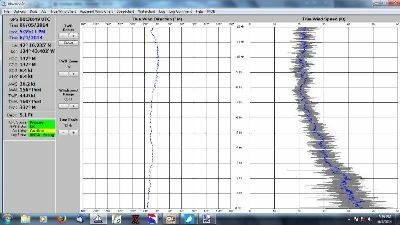 This was well in excess of the forecasts (GRIBs, and human-generated). 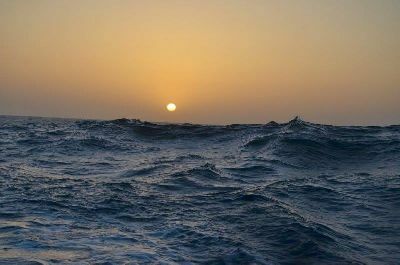 The High Seas forecast was declaring gale warnings further offshore, but merely small-craft warnings and smaller seas within 20 miles of land. 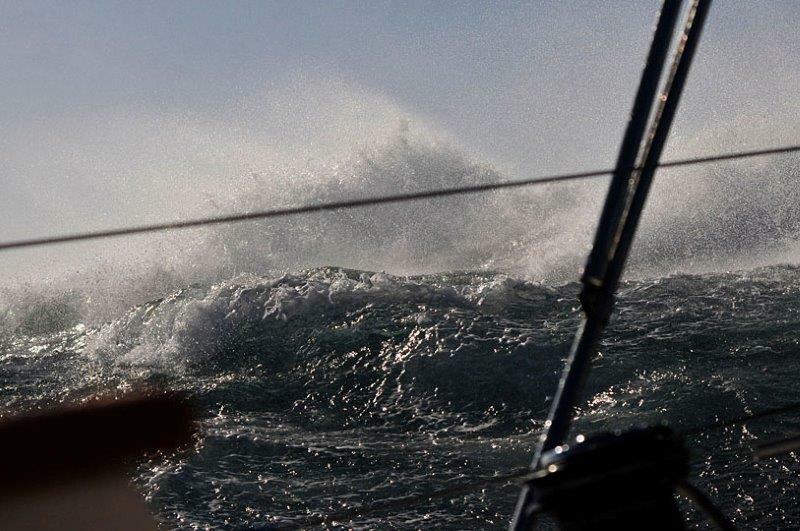 At this point we were heading slightly offshore. 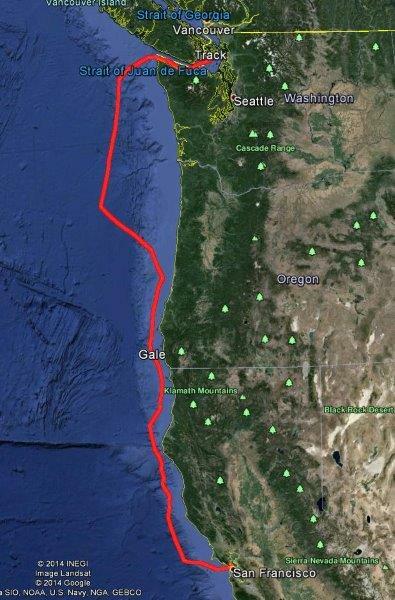 Actually, our heading was the same, but south of Cape Blanco the shoreline tends east. We were only 20 miles offshore, but we decided to try our luck closer to shore so we jibed, taking us closer in. Things did calm down. The waves were a bit more confused, but in most cases we stayed about ten miles offshore, and off of the 100-fathom line. The winds were still in the high 20′s (and more sometimes), but by comparison, it was a gentle sail. 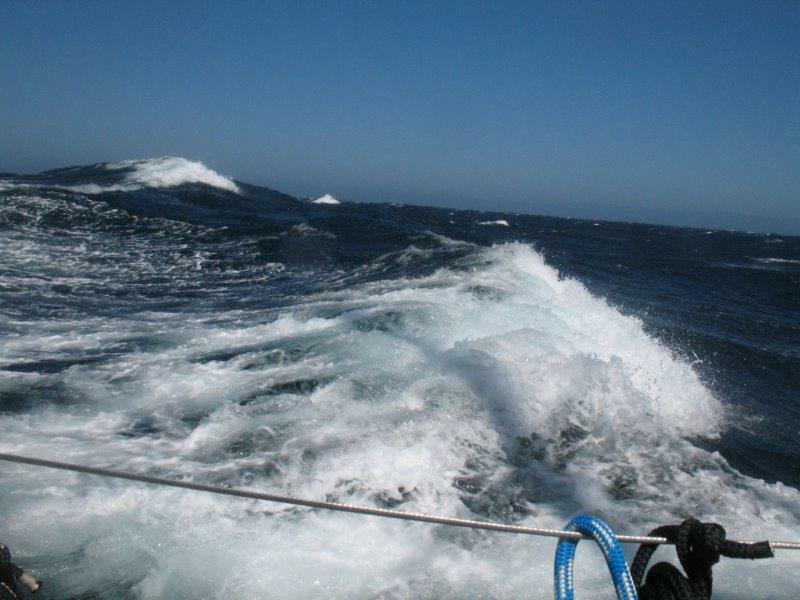 Once south of Point Arena we tucked further inshore until the wind fell to practically nothing. For the rest of the day we jibed inshore and offshore, trying to stay in good wind — not too weak, not too strong. 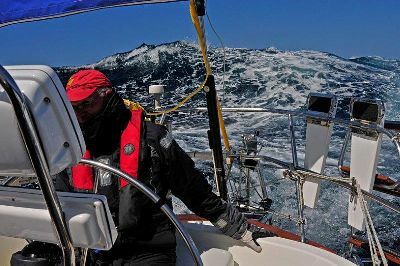 We sailed until the Farallon Islands, and sunset, when the wind died to less than 5 kts. 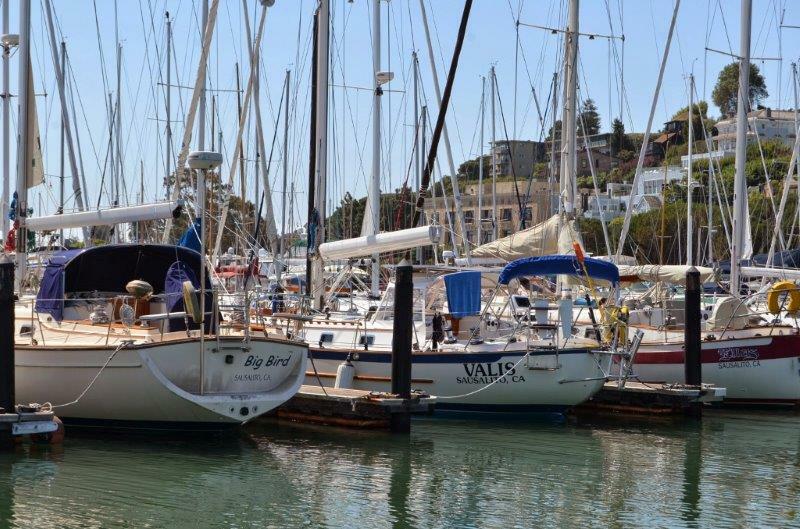 We then motored the rest of the way, through the Gate and into the bay, arriving just around sunrise in our slip (just one dock away from our old Sausalito slip). This was a good trip. 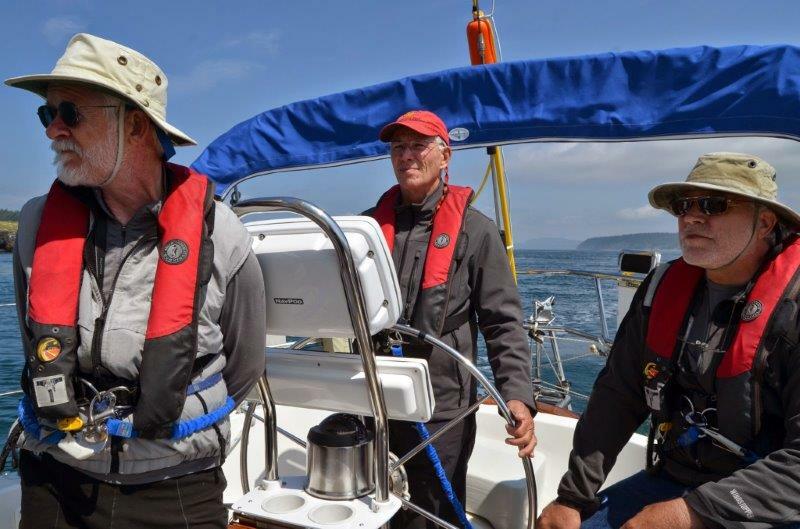 The crew did well in challenging conditions, and we had a great time sailing together. It was an excellent shake-down for the Pacific Cup. This entry was posted on Monday 16. June 2014 at 20:55 and is filed under: Pacific Cup 2014. You can follow any responses to this entry through RSS. | Trackback URI. I believe we were in contact with you via SSB. 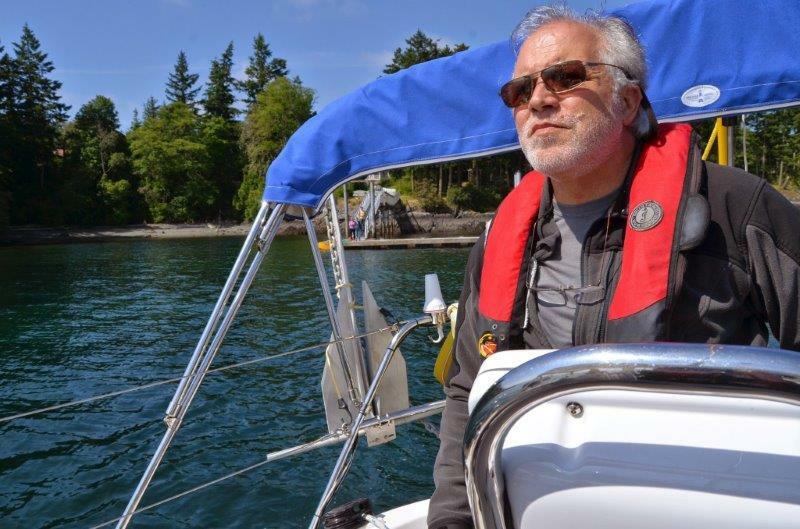 I was helping Peter Heiberg, owner and skipper of “Scaramouche”, deliver his yacht from Vancouver to SF Bay. 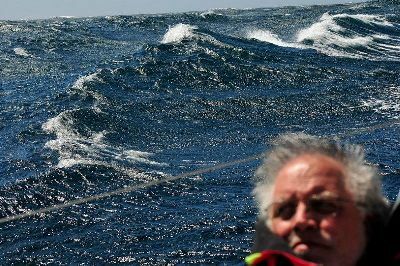 We talked to you a couple of times and despite your weather report we still hit gales as well ( 40kts and 14ft at 9sec) plus the soakings. It’s the nature of the beast. Anyway, good luck in the Pacific Cup. Looks like you have a nice strong boat and able crew. Send me an email if you ever need crew. 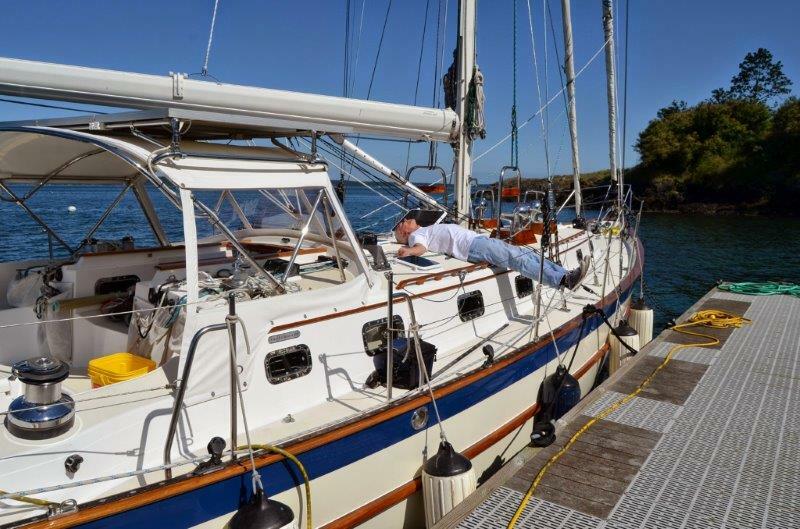 I live and sail out of Humboldt Bay.